Multiple chemical sensitivity, also known as MCS, can best be described through a scenario. Let’s say that you get on the subway and sit next to someone that has a lovely smelling perfume or cologne on. Although it smells nice, it is also very strong and suddenly your eyes begin to water and you begin to sneeze uncontrollably. After getting off the subway, you pass a florist on the street that is spraying his flowers with pesticides. This also makes your eyes water and forces you to sneeze constantly. This is an example of what a person with MCS goes through. MCS is a world-wide health problem that is caused by our toxic environment. It is characterized by an extreme sensitivity to chemicals. A person with MCS may have an immediate or delayed reaction to chemicals. Because there are so many symptoms associated with MCS, it is often misdiagnosed. Listed below are some of the symptoms that may occur after being exposed to chemicals. When you are living with MCS, it seems as if the world is out to get you. Even chemicals within your own home can upset your body and cause all or some of the above mentioned symptoms. Formaldehyde is a chemical that enters the air you breathe inside of your home from laminated furniture, carpet, plastic, insulation and adhesives. Other dangerous chemicals such as household cleaners, solvents, pesticides and lawn chemicals can also get into the air in your home. In order to remove these chemicals and breathe easy, it is recommended that someone with MCS have an air purifier to continually clean the air of harmful chemical contaminants and odor. Many personal care products have synthetic chemicals in them that can onset symptoms that could affect your health long-term. To prevent these reactions, a person with MCS might use irritant free products. Most people with MCS find that the food they ingest is another key source of chemical exposure. For many, switching to organic food makes a difference in their overall health. MCS sufferers should pay close attention to the food labels though. Many are not yet FDA approved. Make sure that your selection is organic and not just “all natural”. The organic food market has dramatically increased in the past few years. More people are turning to it for healthcare reasons and because it is making some feel better and have more energy. The key to surviving MCS is to stay away from substances that will trigger the onset of symptoms and to improve your indoor air quality. Some people are so sensitive to so many different chemicals that they do not allow synthetic materials in their homes. Others know what chemicals onset the symptoms and are able to avoid them more easily. MCS patients can take advantage of Smelleze™ Reusable Deodorizer Pouches. They clean your air by absorbing toxic odors and indoor air pollutants without covering up with harmful fragrances or chemicals. These hazardous chemical odors and contaminants are given off from a wide variety of products and can be harmful to your health. They include mothballs, paint, solvents, pesticides, fragrances such as perfumes and air fresheners, adhesives, smoke, dry-cleaned clothes, and cleaning agents, to name a few. Researchers say that these types of chemicals and odors can cause a number of medical problems, including MCS and respiratory problems. Organic bedding, natural personal care products, organic food and air cleaners like Smelleze™ will be an MCS sufferer’s best friends. Even if you do not have MCS, please remember that these toxins enter your body just like everyone else’s. MCS can develop at any time. Staying away from these toxic chemicals will help you to achieve a healthier immune system and avoid MCS. Hi, I am very interested in your products, since I have been diagnosed with MCS and need to eliminate all possible odors in my home, but also at work in my office. Recently I purchased a new product for cat liter box (light weight cat liter). This product although it says no odor on the package when using it for a week I began to feel really sick. I realized it was the cat liter itself that has chemicals in it to the point that now I cannot seem to get rid of. It is in the carpets ( I washed them but still it smells), it is in my cats fur and cannot seem to get rid of it (is your product safe to wash my cats in? ), it is in my sofas (made of material not leather), it is everywhere including my cloths and I am literally going crazy, my nerves are shot. I live in a condo unit and have HVac —-please which ever product you recommend I will use…need your help ASAP. I would not recommend washing your pet with any of out products. However, you could sprinkle your pet with Smelleze® Natural Chemical Odor Remover Powder, loosely rubbing into fur. Place pet in an area where dust can be shaken off without causing a mess. Repeat this process the next day if necessary. 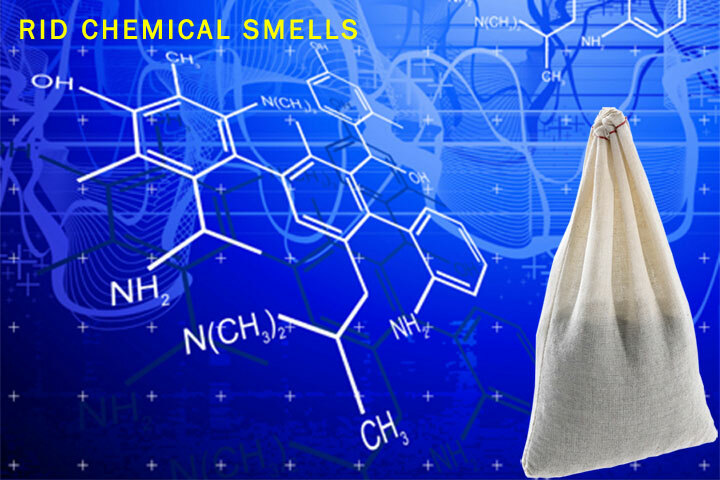 Secondly, use Smelleze® Reusable Home Smell Deodorizer Pouches to eliminate the indoor airborne odor. For a breath of fresh air, simply place Smelleze® pouches in all rooms or spaces with the bad odor. If you have a HVAC system, you may also place the Smelleze® pouches on your return air vents, and/or in front of the air return duct in your furnace to filter the odors out faster. Overall, use one pouch for every 150 square feet of area treated and smell the difference. You can use additional pouches for areas with severe odors. This is also an effective treatment for absorbed elderly odors that outgas slowly since the Smelleze® pouches work continuously 24/7 to eliminate odors which otherwise would be reabsorbed to continue this cycle. My son is extraordinarily sensitive to smells that stands in his way of using some drugs that would help him with his constant pain from some procedures to his brain. Is there any procedure or mechanical tool that can help block the smell of most if not all smells? Is there any smell blocker that my son can use so he can take some medication or mechanical tool that would stop smells from reacheing him? It realiyl is a huge problem for him.